“Mas Saline” is a wonderful stone farmhouse set right in the middle of nature in Gualta, close to Girona and Barcelona, but in a different world altogether. Located in the heart of the Costa Brava, in a privileged place 5 min to Pals golden sand beaches. The property is a paradise for families with children. Peacefully secluded between the fields and connected to the world by a farm road surrounded by apple and sunflower fields. 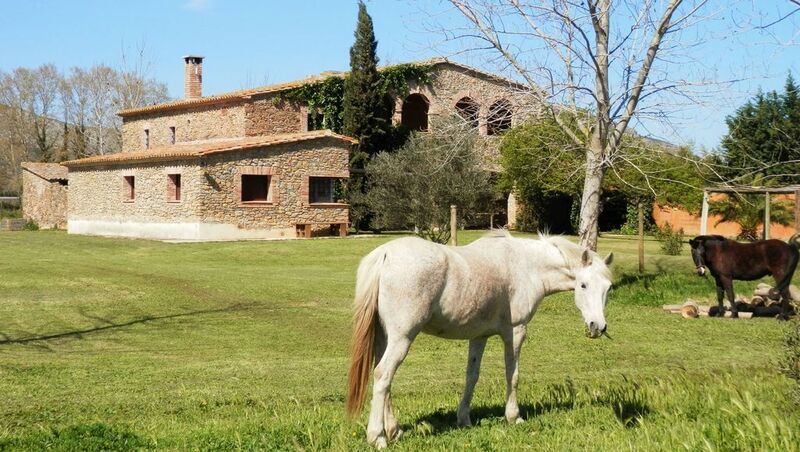 The house, totally renovated in 2005 is right in the middle of a property of 5 hectares of land in full production of Golden Apples, Extra Virgin Olive Oil and alfalfa that is used to feed the family of horses and ponies that are living in the estate. The house is on two levels and is a perfect example of tasteful, rural elegance. Functional and tasteful: The entire house is decorated with a functional yet cool taste, meant to give people all what's needed to have a luxurious and comfortable stay. Large 650 sq foot kitchen area, fully equipped with generous working space for gastronomy lovers. Thick teak 250cm dining table with 12 chairs flanked by a big fireplace with a restored original stone bread oven. All bedrooms have good beds and impressive views of all the Emporda plain and the Castle of Montgri. Bathrooms are complete and the 3 livings are very comfortable. 2 living rooms in the ground floor, a charming and cozy living room with local TV, plus another spacious living room with Satellite TV, board games table, chess table and fireplace. Spacious office space with WiFi broadband connection. Old stone walled stable and porched patio, which is perfect for intimate lunches al fresco, and romantic candle light diners. Thanks to the stone walls, the house is fresh in summer, and very comfortable in our temperate winters. Equipped with double glass windows and modern central heating system for winter season. Spring time is explosive in our property; nature begins to flow in torrents. Birds nesting and crops growing. Wonderful sky light, and crystal clear atmosphere. Landscape is brightly green. Apple harvest season: starting early in september, the harvesters enter the estate to collect more than 100 tm of fresh and juicy "Golden Apples". Really worth to be around during these dates to get some… an apple a day keeps the doctor away! "Extra Virgin Olive Oil" harvest season: Held during one week, variable from late october to early december. The Olive harvesting is a unique experience to live if you visit us during these dates!. Winter season: life in our property is so peaceful and enriching for the soul. 3 large fireplaces, and the best wood stored, are ready for your calm evenings of reading and relax. Activities: Winter and Spring are the best seasons to practice horseback riding and cycling in our property. The Mediterranean sun shines almost every day. During winter/spring, horses love to gallop across the farm roads leading to medieval villages. The best reward before going back home is a long gallop along the dunes of Pals beach. Golf lovers will love to hear that the prestigious “Emporda Golf Resort” (18 links / 18 forests), and the “Par 3 Gualta”, both are at a mere 3 min distance from the property across the farm road. Diving and Water sports in the 'Medas Islands' diving resort, in Estartit, 10 min away by car. Cool nightlife with fashionable places in almost every small village in the area. Two of the coolest open air nightclub/restaurants in Costa Brava: the “Mas Sorrer Jazz Bar” and the "Aerodrom Club" are located just 3 minutes drive. Private parking area into the property. Three living rooms. Main living room in the ground floor, 40 sqm seating 12. Dining area of 70 sqm including an open plan kitchen. Main dining table seating 12, adjacent to an extra dining table seating 8 ideally fitted for kids. Board games. Card games. Pool table. Games for kids. Water sports in Pals Beach Club. 10 miles. Emporda Golf Resort next to the property. This was a wonderful location for a family holiday (7 adults and 2 infants). The house is spacious and in a lovely setting with very large grounds. Whilst it has the benefits of being away from other properties (finding it will test your satnav! ), it is not far to the nearest shops, some unspoilt towns or the beach. There are lots of games etc so it's perfect for either an active or a relaxing holiday. Our host Roger was extremely helpful both in relation to the booking process and liaising with us during our stay at Mas Saline. He also introduced us to Marina, a professional chef, who visited us on 4 of the 7 evenings to cook some wonderful meals. This was a real bonus since having very young children with us it would not have been possible to venture out to restaurants in the evenings. The combination of a lovely house in beautiful, quiet surroundings with our own personal chef meant that we had a great holiday. We spent the most amazing time in Mas Salinas farm. The house is big, spacious and can accommodate very big families. It has plenty of hidden corners which is like paradise for children with so many things to explore. The garden is huge, has several settings in the shade which is very welcome in hot summer days. The pool and the animals (horses, cats with kittens and hens) were our favorite spots where we spent hours with kiddos. If you are not afraid of getting your hands dirty, you can feed horses, bring water to them, collect eggs, feed cats and experience life in a farm in so many other ways...Also, apples from the garden were absolutely delicious!!! We spent 5 days for a family vacation and reunion at this hacienda right by Torroella de Montgri. We loved our time there. The property is out amidst apple orchards with a looming nearby hilltop castle, with lovely surrounding landscaping. The views each evening as we relaxed were stunning. The house itself is rustic and charming, a true Spanish villa. Beds were comfortable. Really quiet at night, so we all slept great. Kids took advantage of small outdoor pool. Horses are on the property (and it can be arranged for you to ride them), and there are 4 (outdoor) resident cats, which my kids really enjoyed. There's even a chicken house that we harvested eggs for breakfast from each morning. There's loads to do nearby: pretty beaches just a few miles away, marine preserves (with boat excursions from L'Estartit), medieval villages and castles (e.g. in stunning Peratallada), ancient Roman and Greek ruins (in Empuries), and museums (e.g. Salvador Dali in Figueres), not to mention numerous great restaurants. Helping us to take advantage of all of that was our fantastic host, Roger. He provided loads of options for us, including putting together itineraries of sight-seeing based on themes of what we were interested in and providing specific restaurant recommendations. He was so kind and agreeable, helping us out with all of our questions. We wish we could go back! Thanks, Roger! If you're planning a Barcelona vacation, get out of town for awhile too and stay at Mas Saline. What an incredible rustic masia. I booked Mas Saline for my 40th birthday. I had 9 girlfriends from school days flying from all over the world for the reunion. I felt enormous pressure to get the right house - plenty of space, a good kitchen and beautiful grounds. Mas Saline did not disappoint. The setting and character of the house exceeded expectations and we all had 4 days of paradise. The location of the house is super surrounded by lush countryside, quaint villages and beautiful coastline. After years of reunions my girlfriends said this was the best of all time. A huge thanks to a kind and helpful Roger and his family. Hoping to come back for my 50th birthday reunion! Our first experience with Home Away was a smashing success thanks to a lovely stay at Mas Saline and very good recommendations from our host, Roger. The location of this beautiful farm home is ideal for visiting the Costa Brava beaches and the numerous medieval towns of the region. The home is a beautifully restored farm house surrounded by apple orchards, olive trees, and gardens. We started each day with fresh eggs on the balcony overlooking the property, and we often ended the day with a swim in the pool. Guests must visit the local market Monday morning, eat at some of the local restaurants, and arrange a horseback riding tour. We would definitely stay here again and recommend it highly to others. We are 3 couples with 4 young children. We stayed at This house with a hoge garden with pool for a week. The husbands played golf for 3 times. The golf Courses were less Then 5 minutes drive away. We bbq'ed, played pool And went to The beach. The beach is less Then 10 minutes drive away. Shopping, restaurant And supermarkets are less Then 5 minutes away. The landlord Roger was very kind And very helpfull. Thanks Roger for This Amazing week. Your house was so Nice to stay at. We ll be back! Baix Emporda, is an unmatchable area to visit during all year round thanks to our Mediterranean climate. The sandy and sunny beaches mix with the rugged coastline and the numerous medieval villages, where daily 'slow food' markets take place. Sport activities: golf, water sports, horseback riding, biking, diving, ultralight and plane flying. Numerous expressions of art take place all year round, Dali museums, gastronomy forums and many places of cultural and historic interest which are a must visit for the travellers with cultural inquietudes. Changeover day is Saturday in peak season. During other seasons the changeover day can be adjusted.